The U.S. Navy, contractor Lockheed Martin, and shipbuilder Newport News are racing to complete a key component for the new aircraft carrier USS Gerald R. Ford – an 80-meter-wide retractable hand. Seen by proponents as a game-changer that will reinvigorate the carrier platform, critics contend that Navy plans to put a giant mechanical hand at sea are ill-conceived and threaten to derail the new carrier’s 2016 commissioning. Those familiar with Giant Hand describe it as a key part of the Gerald Ford, second only to the carrier air wing itself. A close to the program described it as, “… a hard power tool and a soft power tool, a strategic communications tool and, like, just, wow.” The source was overcome with emotion and could not give further comment. Although shrouded in secrecy Giant Hand is thought to primarily be a weapon system. Stowed in a protected position behind the carrier’s “island,” Giant Hand can be deployed to shield Ford-class aircraft carriers from Chinese DF-21 anti-ship ballistic missiles. Giant Hand can also be used to counter swarm attacks by smaller vessels or engage land targets up to 50 meters from shore. Giant Hand is also thought to have a secondary capability as a secure, line of sight communication system. Yet cost overruns and technical problems have plagued the program. Giant Hand is $855 million over budget and said to be fourteen months behind schedule. Further, the middle finger currently does not fully extend, a problem the Navy admits hinders Giant Hand’s communication uses. 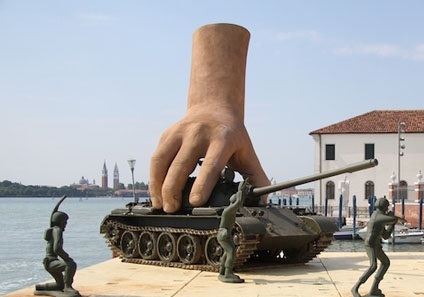 Calls to the Navy’s Giant Hand program office were not returned. 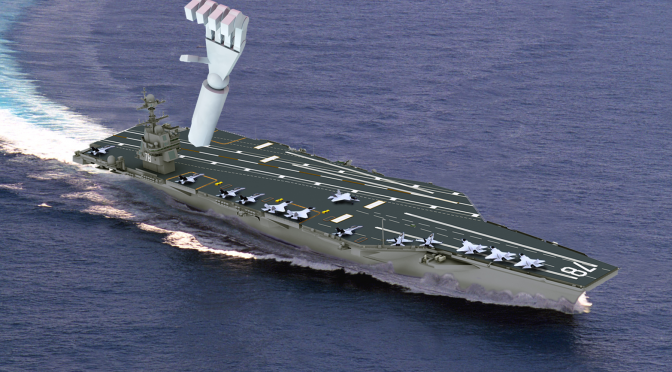 Giant Hand is one of several new technologies to be introduced in the Ford-class carriers, along with the Electromagnetic Aircraft Launch System (EMALS), increased automation, stealth features, and the new A1B nuclear reactor. Navy leadership is banking on Giant Hand to give it a decisive advantage over the The Chinese People’s Liberation Army Navy (PLAN), which commissioned its first aircraft carrier in 2012 and has reportedly started work on indigenously building more. China is thought to have requirements for at least three carriers, and U.S. Navy officials are said to have looked for new technology that would preserve the Navy’s lead. Critics contend that Giant Hand is a prime example of a flawed defense program. “It’s too expensive, the technology isn’t proven, and the hand is not wide enough,” argues Jacques Shower, a defense analyst who helped design the F-16 fighter jet. Privately, Navy officials concede that they’d like the hand to be wider and it may need two or three blows to flatten a Somali pirate village. Still, officials believe that as currently designed the hand will be capable of fulfilling the mission. Previous PostSurvivor: Nikumaroro IslandNext PostGodspeed Liaoning!